I’ve been on a really big Star Wars kick as of late. 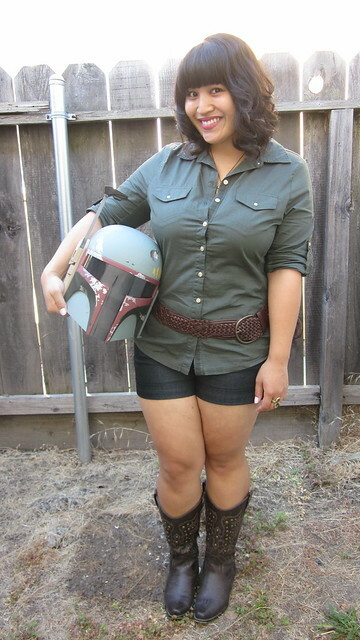 A couple weeks ago I found this really rad Boba Fett helmet at Target on sale for $10 (originally $40). It was the only one left, and I thought it would look cool on my bookshelf. I couldn’t pass it up! It was too good of a deal. And I’ve been wanting a Stormtrooper action figure for quite some time since I’ve seen people take really amazing pictures of them all over Flickr. Take a gander here. I got my own little Stormtrooper the same day I bought my helmet (and the green shirt I’m wearing pictured above, which was also on sale. SCORE!). I’m not quite sure what to do with him yet. I have some little toys and accessories to use for a silly photo shoot though. I don’t even know where any of our Star Wars DVDs are, or if we even have any! I know my family owns them on VHS, but I’m too lazy to set up my VCR (which is somewhere in the garage). Oh well. At least the whole saga is coming out on DVD/BluRay next month! 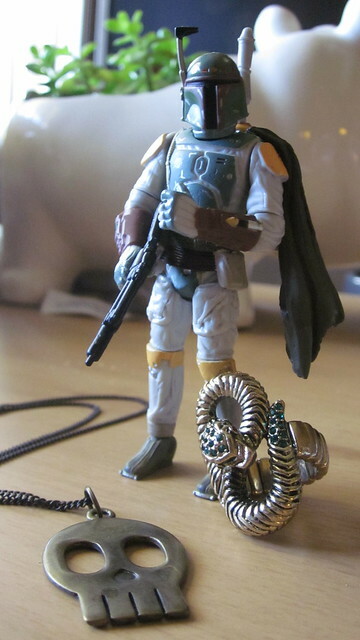 HAHA I can totally picture you rocking out in your Boba Fett helmet! 😉 You found that at Target, eh? Hmm, suddenly I am no longer apathetic that Target is coming to Canada. Woohoo!! !